Size: 40 40 40cm. 1 x Studio Photography Tent Box. Foldable design is unfolding a whole new level of possibilities in smartphone photography. All-in-one portable studio shooting box is easy to use. The light box with high reflective grain fabric, effectively enhance the brightness of light box. The opening can be used at the front or the top of the tent, to provide different angles. This 80cm x 80cm LED Product Lighting Cube Kit is perfect for photographing all products up to 70cm wide. Photographs can be taken from both the top and the front. Professional 50x50x50cm Photo Studio light box LED soft box Shooting Light Tent photo box set We have a full-size range of LED light box 5 [0cm click here] (https://www.ebay.co.uk/itm/232660286952) [50cm click here] (https://www.ebay.co.uk/itm/232660295974) [60cm click here ] (https://www.ebay.co.uk/itm/232731883785) [70cm click here] (https://www.ebay.co.uk/itm/232731888262) [80cm click here] (https://www.ebay.co.uk/itm/232486518325) Features: ---Unique design, good quality and easy installation. ---Standard color temperature: 5500K color temperature make photo color standard. ---Easy shooting: Press switch comes steady soft built-in illuminant, no need to adjust lighting, portable with highly bright shooting effect. ---Easy to maintain: Delicate Acrylic plates and Acrylic white background paper; wipe dust with wet cloth or ethyl alcohol. 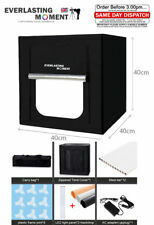 $Professional 50x50x50cm Photo Studio lightbox LED softbox Shooting Light Tent photo box set We have a full-size range of LED light box [40cm click here] (https://www.ebay.co.uk/itm/232660286952) [50cm click here] (https://www.ebay.co.uk/itm/232660295974) [60cm click here ] (https://www.ebay.co.uk/itm/232731883785) [70cm click here] (https://www.ebay.co.uk/itm/232731888262) [80cm click here] (https://www.ebay.co.uk/itm/232486518325) Features: Unique design, good quality, and easy installation. Standard color temperature: 5500K color temperature make photo color standard. The Fovitec StudioPRO portable, folding shooting table is the perfect tool for professional & hobby product or still life photography. Product, still life, macro and food photography. No assembly required. Condition is New. 100% works Tested as seen in photos. It has Multiple speeds and turns both ways. PHONE STAND NOT INCLUDED . MK50 Large Photo Light Box Studio Tent for Product Photography. MK50 Large Photo Studio Box. - Create accurate and professional product shots with our MK50 Large Photo Light Box Studio. - Fluorescent tube light source for high quality pictures. FUNTREND24 präsentiert DasCUBE 50 von LIFE of PHOTO ist eine ultraportable Lichtbox für die Produktfotografie. Dank der im Deckel integrierten eingenähtenSMD LED-Beleuchtung beträgt das Gesamtgewicht des Mini-Studios nur 2,6 kg ! KAISER CUBE STUDIO / LICHTZELT 5893 NEU !!! Einfacher Aufbau durch Auffalt-Automatik. Kaiser Lichtzelt / Cube Studio 5893. 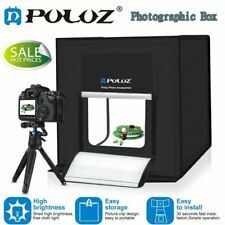 Portable : Fold-able design enables ,In minutes, you can assemble a photo studio in anywhere,ideal for shooting small products, such as digital products, jewelry, watches, and more. Isle of Wight: PO30-PO41. 30cm, z.B. Glas, Schmuck, Spielzeug. Handys, Tablets & Smartwatches. Batterien dürfen nicht in den Hausmüll gegeben werden. Endnutzer sind zur Rückgabe von Altbatterien gesetzlich verpflichtet. Wir haben Sie darauf hinzuweisen, dass Batterien nach Gebrauch an uns unentgeltlich zurückgegeben werden können. SOFTBOX luce. 6 sfondi colorati. 1 softbox con 2 led inclusi. luce bianca Photo Studio. 6 sfondi colorati. Studio Box. 3 fonti luce led. KIT PORTATILE richiudibile. Dörr Photo Box LFPBF-40A klappbar und transportabel. Die Box stammt aus einer Geschäftsauflösung und ist neu und unbenutzt. Lamp: 1 fluorescent tube lamp (manufacturers picture shows 2 but I guess that unit was a protoype as that is way too powerful?). Used only on one shoot so in Mint, as New condition. 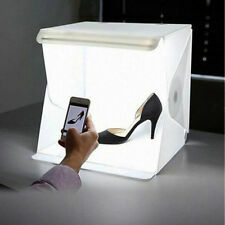 Make your product photography so very simple and of a professional standard with this portable photo light box studio. Digital Concepts Portable Lighting Studio Kit NEW w/Lights, tent, and back drop. 8x8x8 Condition is New. FAST SHIPPING Check out my other items , and Have A Great Day! Includes two table top lights with retractable legs. Studio box size: 16" x 16" x 16". Special nylon diffuser screen creates soft lighting, eliminates harsh shadows with a balanced color and remarkable definition. Make : Fovitec. Wipable Acrylic Surface for Bright & Pure Backgrounds: Clean down table top imperfections to produce desired scenes. Glare-Free: Matte finish eliminates excessive reflections and hot spots from strobes or continuous lights. Bought for a project that never happened. Height: 130cm. Width: 60cm. This shooting table is adjustable. This is a well -designed, large, white photo cube (32"x32"x32"). It creates professional quality pictures, taking the place of multiple studio lights. Ihre Schreibtischlampe ist zu schwach und verfälscht die Farben?. Das neue HELIOS TT2 Table-Top Set schafft hier Abhilfe! Mit den beiden Leuchten haben Sie vielseitige und praktische Lichtquellen für die Produkt- und Makrofotografie zur Hand. The blue background is reversible with one side having a darker blue with velvet-like finish while the other side is lighter blue with a smooth finish. The removable front panel provides a double-draw zipper to isolate the lens when shooting reflective, mirror finish subjects. Photography Translyte Lightbox. Condition is Used. Dispatched with Royal Mail 2nd Class. Lastolite Professional Cube Lite Mini Studio 24" x 24"
Lights from Any Side. Creates the Perfect Shooting Atmosphere. Ob in der Portraitfotografie als hartes kaltes Licht durch die silberne Mattierung, als Softbox, die diffuses weiches Licht erzeugt. Sie haben somit 3 Beleuchtungsarten in einem Produkt. direkte Beleuchtung, Softbox und Lichtzelt in Einem. Use it to give depth and realism and make your products stand out. With no extra skills required, you can transform your images by simply placing your product on one of the boards. Including both black and white boards, you have the potential for high key or low key shots. The front window supports a horizontal shooting and the open window on the top supports a 90 degrees vertical shooting. Photography led Light Cube - Equipped with two 3.5W 6000K integrated LED lights which can soften and reflect lights, eliminate glare and spots for a perfect shooting. Testrite CS3-2344 Copy Stand & Lights. CS-3 COMPLETE. Pop-Up Lichtwürfel weiß 90 x 90 x 90cm. Das zu fotografierende Objekt wird in den Würfel gesetzt und erhält durch den Stoff gleichmäßig gestreutes Licht. Schatten werden dadurch weicher und Reflexionen vermieden. ULTRASLIM SPESSORE 1 CM. E 3200 °K (LUCE CALDA). 1 PANNELLO LUMINOSO A LED. 6000°K (LUCE FREDDA BIANCHISSIMA). 33 X 33 (MISURA UTILE) cm. Area effettiva: 33 X 33 cm. Misura esterna : 38 X 38 X 1 cm. If you receive our invoice but not ready to check out, consider it a running tally. It is always a pleasure to have you as a guest in the Morezmore Estate. The Morezmore Estate. Photo Soft Light Tent. Flash & Lighting. Original manufacturer software once opened. Computers & Accesories. Binoculars & Spotting Scopes. Batteries & Power. Bags & Cases. Albums & Storage. Square Perfect 30 Inch Photography Light Tent-Photo Cube Softbox Light Box 76cm. Condition is Used. Shipped with USPS Priority Mail. Set Reproständer MRS-1 (Höhe:72 cm) incl. 2 x Table-Top LED Leuchte CN-T96. Set - Reproständer MRS-1 (Höhe:72 cm) incl. Produktart: Reproständer. 1 x Reproständer MRS-1 für Repro- und Makro. In dieser Preisklasse ist dies einmalig. 1 x Sfondo bianco. 1 x Sfondo nero. Realizza foto o video perfetti con box fotografico completo! box foto con led e 2 sfondi intercambiabili nero e bianco. Striscia con 20 led cavetto USB adattatore da reteINCLUSI. PULUZ Photo Studio Light Box Portable 60 x 60 x 60 cm Light Tent LED 5500K Mini 60W Photography Studio Tent Kit with 3 Removable Backdrops: Black Orange White UK Plug Photos from their website. Unwanted gift. Digital Imaging Light Box 1612 - Photo studio in a box.